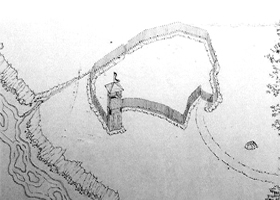 An artist's rendition of how the French fort probabaly was built. While Native Americans were still living the area, French explorers and then French fur traders came to the area. In the 1730s the French built a fort between the Indian trails which Routes U. S. 30 and 6 now follow. A reconstruction of the Old French Fort can still be seen [Francis Rd., east of Gougar Rd.]. The French and Indians Wars (1754-1763), which were fought between the French and the British, shifted nominal control of the area from the French to the British, who passed control to the young United States in 1783. The Illinois Territory was carved out of the 1787 Northwest Territory in 1805 and Illinois statehood was granted in 1818. Settlement in Illinois was nearly all in the southern third of the state along the Ohio, Wabash, Mississippi and Sangamon Rivers. New Lenox area permanent settlement came more than 10 years after statehood.